American Federation of Labor and Congress of Industrial Organizations (AFL-CIO) Department for Professional Employees recently released a fact sheet exploring, among other topics, library staff in the workforce, issues of pay and pay equity, and librarian representation in unions. This fact sheet uses data from a variety of sources, but draws primarily from the U.S. Bureau of Labor Statistics and the American Community Survey. 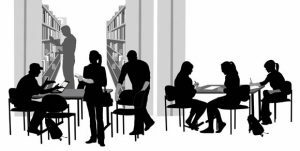 The report indicates that in 2017, there were approximately 194,000 degreed librarians, 40,000 library technicians, and 96,000 library assistants employed in libraries throughout the United States. The majority of librarians (3 in 5, or 60%) worked in academic or school libraries, while about a third (32%) worked in public libraries. The remaining 8% worked in special libraries. The report shows that about 4 in 5 (79%) librarians were women in 2017. Despite making up the majority of the profession, women were still likely to be paid less than men working in similar positions. Among full-time librarians, women reported a median salary of $50,911 compared to $58,032 for men, meaning that women librarians earn about 88% of the salary of men in similar positions. Library workers are included in a professional occupation group that also includes education and training workers. A third (34%) of workers in this group are in a union, the highest unionization rate for any professional occupation group. 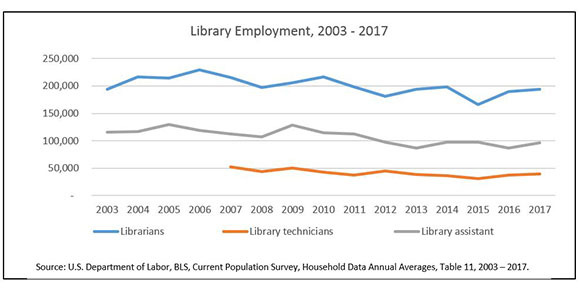 In 2017, about a quarter (26%) of librarians were union members, joined by about 1 in 5 library technicians (19%) and library assistants (22%). Both librarians and library assistants who were union members reported earning about a third (31%) more than their non-union counterparts did in 2017. For more information, the full fact sheet can be found here. The National Education Association published a report containing the findings of a study analyzing school library data collected between 2000 and 2013. The results show considerable differences in student access to school libraries/media center across the country. At the time this study concluded, 9 in 10 (90%) U.S. public schools reported that they have a library/media center, a percentage that has increased slightly (by 1.4%) since 2003. Inner city schools were the only category to report a loss in the number of school libraries/media centers during the time of the study, while small town, rural, and suburban schools all reported increases in the number of public schools with libraries/media centers. The total number of public school librarians/media specialists has also grown overall, increasing 8.8% during the time period studied. Currently, there is an average of one full-time, state-certified librarian/media specialist employed for every 2 public schools, or one librarian/media specialist for every 1,129 public school students. The librarian/media specialist to student ratio is substantially lower in charter schools, with one librarian/media specialist for every 4,397 charter school students. There is an average of about 4 school library/media center support staff for every certified librarian/media specialist across the U.S. 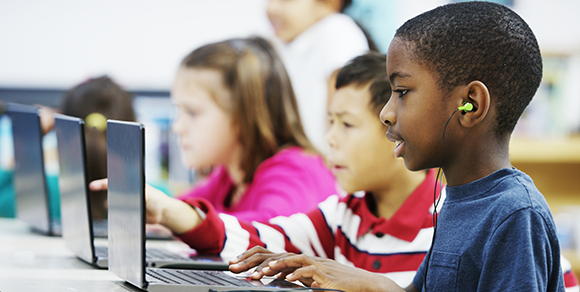 The percentage of students who belonged to ethnic minorities in public schools was a strong predictor of whether the school would have a library/media center. Districts with the most ethnic minority students averaged about 1 librarian/media specialist for every 7 schools, regardless of the districts’ poverty levels, while districts with few ethnic minority students averaged about 1 librarian/media specialist for every 3 schools. At the ends of the spectrum, the wealthiest school districts with low ethnic minority numbers had 5 times more librarians/media specialists per school than the poorest schools in districts with many ethnic minority students. For more information, you can find the full report here. 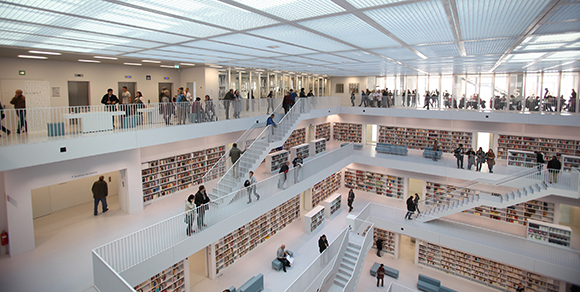 After years of generally stagnant budgets for libraries, the numbers public libraries are reporting from 2014 reveal the continuation of an exciting upward trend. A total of 416 libraries across the country responded to Library Journal’s Budget Survey, and nearly three-fourths (73%) saw an overall increase in their operating budget. That’s a 13% increase from the proportion of public libraries claiming an increase just two years ago. Not all of the news from this past year was completely positive – many libraries saw very narrow margins of victory, some libraries saw persistent budget decreases, and federal funding remained stagnant. And while materials budgets unfortunately aren’t showing much upward growth, the survey did reveal good news all around for library workers. 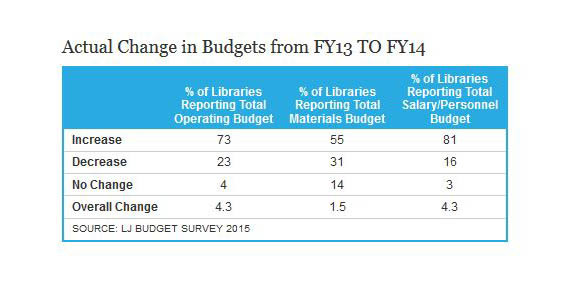 A large majority (81%) of libraries were able to secure a higher budget for salaries and personnel. However, there were some obvious discrepancies between small, rural libraries, many of which saw decreases in this area, and libraries serving much larger populations. Libraries serving half a million to a million people were the most likely to see increases in salary and personnel budgets (59%), and more than a third (39%) of libraries that serve over a million people received an increased budget for library workers. The increased popularity of programming, as well as better staffing and salaries, reflects a growing recognition of the importance of people to the future success and growth of public libraries. You can check out all of the 2014 results and budget data collected by Library Journal here.